Getting your bridesmaids gifts is a given, as is gifting your guests with wedding favours but when it comes to the hen party there doesn’t seem to be a lot of gifting which seems to be a shame. Because it really makes the hen party stand out! 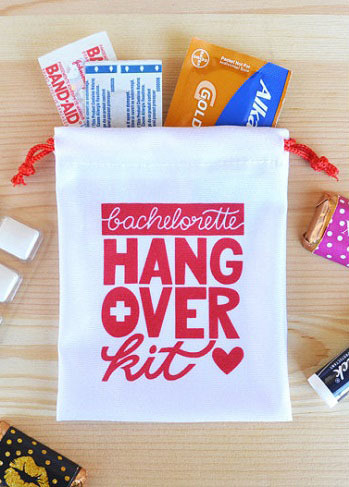 I remember how thankful I was when a friend of mine gave us all a hen party survival kit before the weekend: not only was the gesture sweet, the Ibuprofen was much needed the morning after. Plus, I still use the little bag that all the goodies were put in. So if you’re having a hen party and you fancy treating your fellow hens to some goodies then have a look below at some of the best Etsy hen goodies I could find. The idea behind these is that you buy your girls some bubbly and then you slap on these custom labels to help give it that extra personalised touch. Once all the delicious drink has been consumed each hen can keep the bottle, pop in a pink candle in the opening and Bam! They’ve now got a very cute souvenir of the hen weekend. Hen parties normally consist of different groups of the brides’ friends coming together to form one massive hen troupe. Some of the girls may have never met before and if some of the girls are anything like me then they’ll be terrible at remembering names… Making name badges a great idea for your big night out. Now there are a lot to choose from but I thought these were the classiest and most understated of the bunch. Personally I think this is a great idea, especially if you’re all planning to have a heavy night of drinking. These temporary tattoos can be customised with a name and number so that each and every hen will have the same emergency contact details on her. I know it sounds a little childish but I have seen this work first hand, so I can vouch that they really are a good idea. Hen party games are a must have on a night out and a classic game that never gets old is the hen party scavenger hunt. Easy to play and something you can give to every hen or split the group up into teams this game is a sure fire way to break the ice and keep the laughs coming all night long.